Heat -- Is your cat spayed or neutered? If not, they could be looking for love. These cries will go far beyond, “feed me, I’m hungry” meows, and instead will sound more like the howls. The answer to this is to adhere to your veterinarian’s recommended spay/neuter schedule prior to these raging hormones. 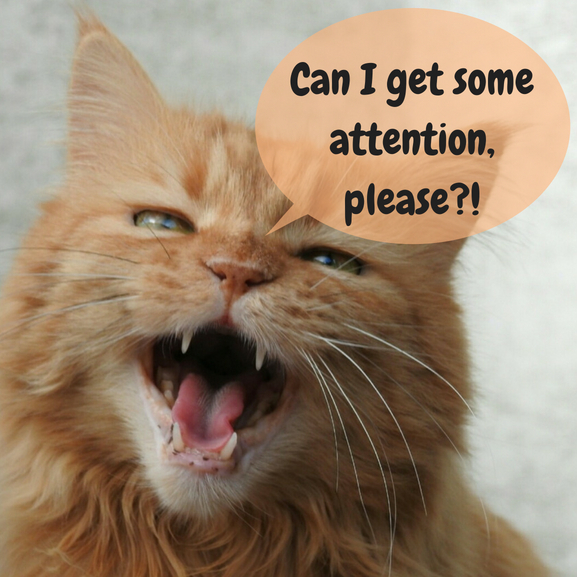 Boredom -- If your cat is bored, he’ll let you know by meowing all the time. Make sure to rotate through interesting toys, and truly devote some time to play and exercise each day. You can also talk to us about preparing to adopt a kitty friend! Old Age -- There are so many health issues that can arise as cats age, including losing hearing and eyesight. Watch your cat carefully. Is he bumping into things? Seeming more hesitant about jumping? If so, it’s time to get him checked out with your veterinarian to see what’s wrong. Sickness -- Kidney problems are common in elderly cats. If your cat is advancing in years, we recommend twice yearly visits for them to monitor their health. You certainly don’t want your cat to be sick! Pain -- Cats who are meowing a lot are trying to tell you something, and it may be that they are in pain. Since they can’t tell you exactly where it hurts, you’ll have to watch for clues. Does your kitty seem to have a problem using the litter box all of a sudden? For example, signs of a urinary tract infection include unusually frequent use of the litter box. When cats are healthy, and they’ve always been vocal, they may be saying “hello” or asking for affection. 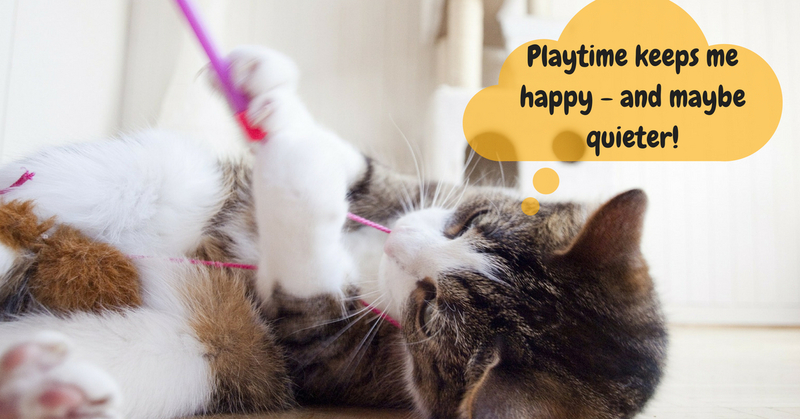 If you have your cat checked out and he seems healthy but still more “meowy” than you would like, you can try these cat training tips from cat behavioral specialist Pam Johnson-Bennett. “How do you do this? It’s actually very simple but it takes patience. Wait out the meowing and don’t acknowledge your cat until he stops. When he’s quiet, immediately reward him. At first, the time that he’s quiet will be very brief but if you only reward him when he isn’t meowing, he’ll eventually realize that silence offers a better consequence than vocalization. Gradually, you can increase the time you’re asking him to be quiet before offering the reward. Now that you know a few of the common reasons your cat may be meowing so much, ask yourself if this is a recent change. If so, please make an appointment with your veterinarian to rule out any serious health problems.